If I were to devise my perfect day, it would most certainly end with the eating of oysters and shishito peppers – outdoors – at the Mermaid Inn. I first came across the shishito at the sushi restaurant we frequent after most school meetings or parent-teacher conferences. 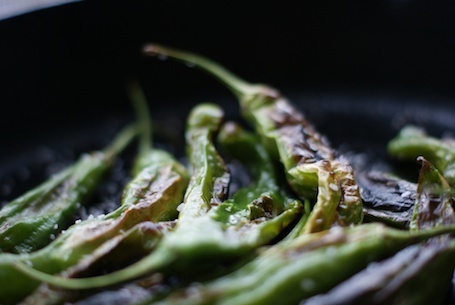 Similar to the “Pimientos de Padrón” found in tapas bars across Spain, shishitos are a mild pepper, grilled or pan-fried until they are blistered, best served with sea-salt and lime. 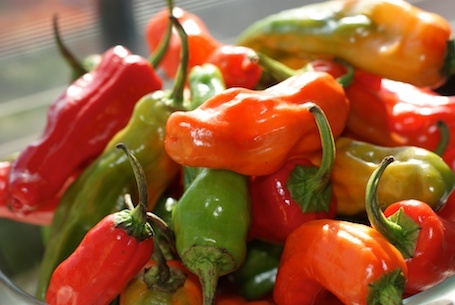 They are an addictive finger-food and exciting to eat as every so often you get one hot enough to make your eyes water. This year, I noticed them popping up at our farmer’s market in August and decided we should try making them ourselves. 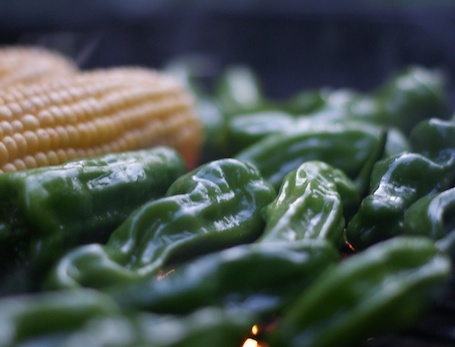 So I bought a bunch and brought them to a barbecue where we threw them onto the grill with the corn. I was concerned that this would somehow make them really spicy and hard to eat in large quantities, but the flavor was more or less the same. Shishito season is August and September, so you if you see them at your local market, get them while you can. Even my five-year-old loves them! This entry was posted on September 24, 2011, 10:05 pm and is filed under Recipe. You can follow any responses to this entry through RSS 2.0. You can leave a response, or trackback from your own site.